(noun) A lek is an area where birds gather during the breeding season for community courtship displays to attract mates. 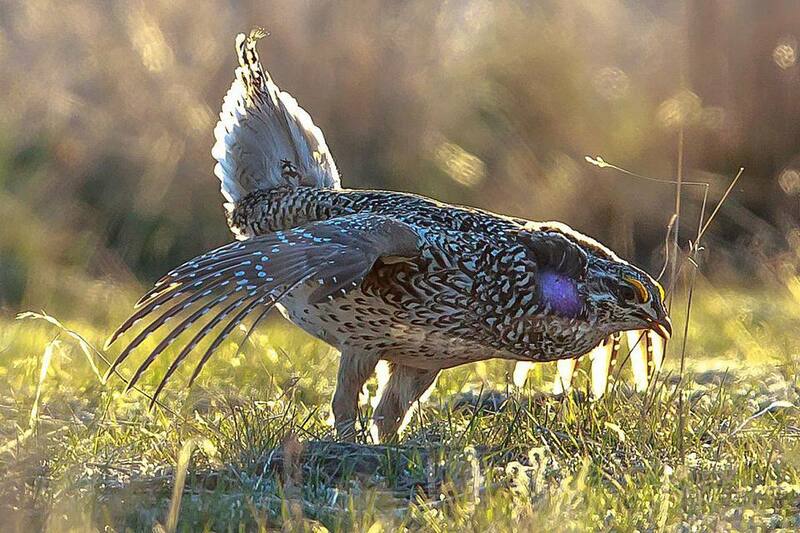 Not all bird species congregate in leks, but they are common for different game birds such as prairie chickens, grouse, and peafowl. Multiple male birds will be doing these movements and activities at once, but If other males draw to close to one male's territory, which may be just a few square feet, aggressive fighting can occur. This could include pecking, clawing, or biting at intruders, beating a competitor with wings, or otherwise trying to drive them away. Females generally stay on the fringes of the lek, observing the performing males but less often participating in the displays. Males that command prime positions in the lek, such as a center position or on a slight rise or branch that may be more visible to many females, have greater success attracting the most desirable mates. Lek sizes vary but generally contain from just a few individuals to several dozen birds in a small area, depending on the lek size, local bird population size, and the time of the breeding season. Depending on the bird species, a lek may be a patch of ground in a prairie clearing, an old tree in a prime rainforest habitat, or any similar location where courtship rituals are common. The key attribute of a lek is that many birds perform their courtship in the same location, not just a single pair of birds. That location remains popular year after year as different birds seek mates, and many generations of birds may use the same lek as long as it remains suitable. The longer leks are in use the larger they become and the more breeding birds they attract. It is important to not confuse leks with other colonial aspects of bird mating and reproduction, and there are several things a lek is not. Flock: While many birds may gather at a lek as they seek mates, they do not necessarily remain together as a flock at other times. Many birds that use leks are gregarious, but several flocks may actually come together at a lek. Just because they all use the same lek does not mean every mating bird is part of the same flock. Rookery: When colonial birds nest and raise their chicks, they often do so in large rookeries that contain many nests. This allows the parent birds to take advantage of communal protection for their eggs and chicks, but this is not part of the courtship process. Birds never nest at their lek sites; instead, the leks are used just for courting and birds build their nests elsewhere. Creche: Some birds, such as penguins, have community nurseries where many chicks and immature birds gather under the care of a few adults while other parents forage. While these areas, often called creches, are important gathering sites, they are not related to courtship or mating and are not part of leks. For most bird species that use leks, the male parents do little or no parental care and a lek is not part of building a nest, laying eggs, brooding a clutch, or raising baby birds. Instead, males will remain at the lek to try and attract additional mates, and a desirable male may be the father to several broods during the breeding season. In addition to birds, some species of fish, bats, insects, and iguanas also join their own leks for courtship rituals. Observing a lek can be a unique opportunity for birders to see otherwise elusive game birds or other desirable target birds. Many leks are in protected areas, however, and birders should approach them cautiously to avoid disturbing the birds. Great care must be taken so the birds do not feel uncomfortable, or the entire viability of the lek may be compromised and the birds' breeding success could greatly diminish. Ideally, birders should arrive at the lek before birds are displaying so they can be in place and unobtrusive as the birds approach, and every visitor should maintain a suitable distance so birds are not disturbed. All noises and motions should be minimized so courting birds are not interrupted. After the birds have finished their displays they will leave the lek area, and birders can move about without impacting the birds. Habitat preservation is critical in lek areas to help protect sensitive species. This includes conserving the land the birds use as well as ensuring the vegetation remains as undisturbed as possible. Other safeguards should also be put in place in sensitive areas, such as minimizing traffic that may disturb birds or could cause vehicular injuries or fatalities to mating birds.